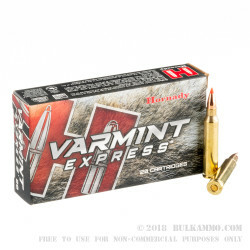 The Hornady Varmint Express is one of the original rounds for the varmint industry. Well at least in the sense that it now is an iteration of what Hornady practically built and marketed ion their own: a dedicated varmint hunting pastime based on super accurate projectiles loaded in screaming fast high powered, small caliber cartridges. 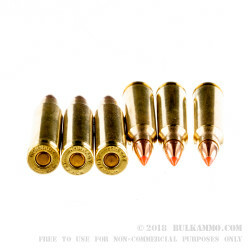 The .223 Remington load featuring the 40 grain V-Max projectile is a powerhouse round that is super flat, super fast and offers nothing but clean consistent kills all day long in the field. The accuracy is second to none but that’s not what defines this round in and of itself. Speed clocked at 3800 fps; energy at over 1275 ft. lbs. and a bullet design that literally sheds wind to avoid flight degradation out past a couple hundred yards. The lethality for varmints and other small game means you turn a premium round into guaranteed kills shot after shot after shot. Same hole accuracy is not a myth with this round, and the more you shoot it, the more you love it, even at the high end of the pricing spectrum for .223 Remington. 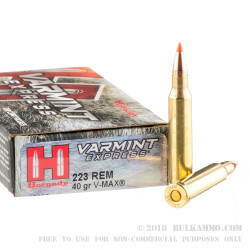 Anyone can get lucky with one shot, but with the Varmint Express .223 Remington load from Hornady, it’s not called luck anymore: just quality ammunition in a repeatable place every time on target. A: Hello Dan, The Vmax projectile is a copper jacketed, lead core projectile with a polymer tip. 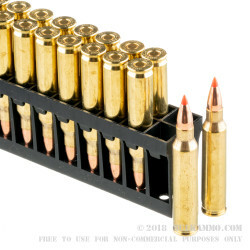 This ammunition does not contain any steel and should have no issues if your range requires ammunition to pass a magnet test.